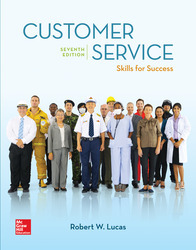 ●	Is the best-selling customer service textbook in the U.S. and recipient of the 2017 Textbook and Academic Authors Association's Textbook Excellence Award. ●	Includes interviews of real-world service providers, case scenarios, and student activities to promote critical thinking. ●	Features Connect, an easy-to-use homework and learning management solution that embeds learning science and adaptive tools to improve student results.